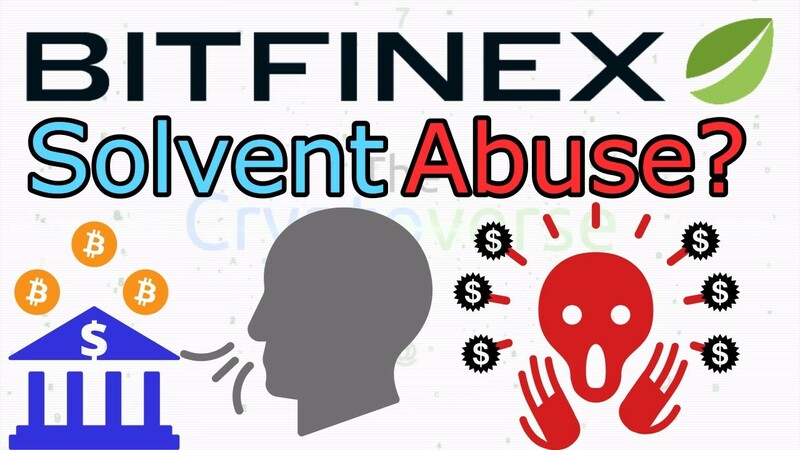 Unless you’ve been sleeping and living under a rock, you’ve probably become more than aware of the fact that there has been widespread speculation about the solvency of Bitfinex/Tether after news hit the scanners in recent days concerning the potential/impending insolvency of Noble Bank (which was known to be Bitfinex/Tether’s primary banking source). Specifically, there was a report that came across the scanners on October 1st-2nd, that claimed that Noble Bank was ‘desperate’ for cash. The bombshell was dropped on a website called, ‘ModernConsensus’. A) Noble Bank (which was/is known to be Bitfinex+Tether’s bank) is entirely insolvent and Tether has simply decided/refused to risk any more of its funding there. This seems a bit unlikely for reasons that we’ll get into later in this article. B) Noble Bank’s impending insolvency has been caused, at least in part, by some sort of latent issue with Tether (whom the article claims was Noble Bank’s primary source of funding) that has prohibited it from being able to make deposits with Noble Bank. Now, there are a few things that must be cleared up before this situation can be analyzed properly. Remember way back, a few months ago, there was this comedian named John Oliver that did a nightly piece on cryptocurrency? In that piece, he was sure to thoroughly describe cryptocurrency, what it is, what it does, and the community at large. Surprisingly, he was able to do so in a highly compressed, yet informational way that didn’t insult the viewer’s intelligence, but also did not become so technical as to ‘go over’ the audience’s head. The relevance of this performance to this article, however, can be found in the portion of the show where John Oliver specifically touched on $EOS, namely Brock Pierce’s involvement. Following the broadcast of this episode of John Oliver’s nightly show (LastWeekTonight), $EOS promptly split ways with Brock Pierce. Up to that point, Brock Pierce was listed as being in the upper rung of leadership in the $EOS protocol with comparable creative control to Daniel Larimer (creator of $EOS) himself. As to whether $EOS’ severance with Brock Pierce is literal or simply in title alone, remains to be seen, but that’s not important. The purpose of the above information about Brock Pierce was just to provide some sort of background context on this (arguably shady) character before speaking about his relationship with Noble Bank and Tether. While this is not information that is super well-known, and its rather difficult to verify at times, there is evidence (from reliable and validated sources) that corroborate this assertion. This specific Twitter post by a user named, Bitfinex’ed, provides ample evidence that Brock Pierce is the founder of Noble Bank (or Noble Markets if you’re looking for better search results from Google). 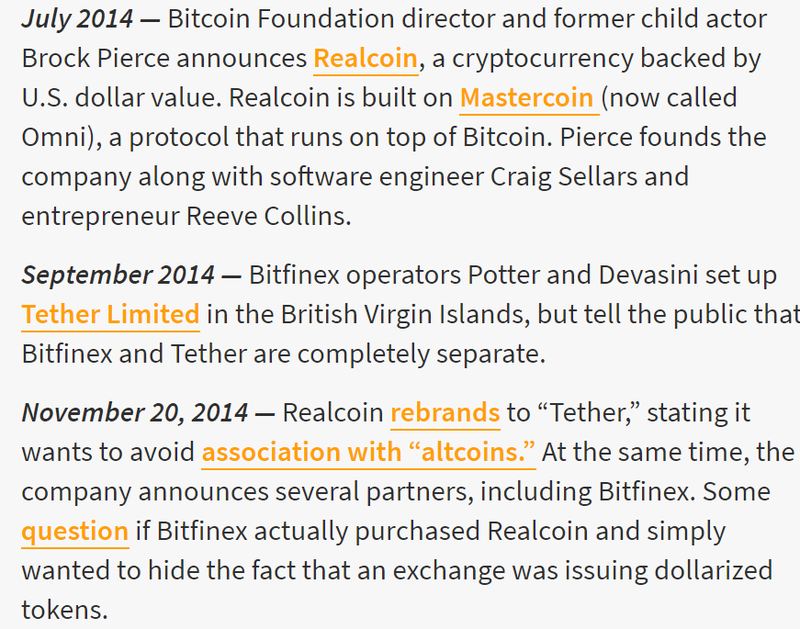 As with many things relating to Tether and Bitfinex, the individuals and organizations that they are involved with, directly or indirectly, always seem to be purposefully obfuscated in some way. Yes, you read that headline correct. Brock Pierce is also the (sole) founder of Tether. The assertions included in the screenshot above are all public record, and can be corroborated with a modicum of research; so, we’ll move on from that and start looking at the rest of the ‘ModernConsensus’ research that was published. Now, given the fact that Tether and Noble Bank are inextricably linked with one another and the founders of Bitfinex (Phil Potter and Devasini) are at least peripherally linked with the organizations, the news of Noble Bank’s insolvency should be ringing substantially more alarm bells. Essentially, Tether was banking with itself, if that makes sense. So, the fact that they no longer can do so shows that there is something seriously wrong internally with all organizations involved. What makes things more confusing though, on its head, is the fact that the report states that Tether ‘refuses’ to continue banking with Noble Bank. Why would that be? And how can we assume that Tether made this decision (if they did) of their own volition and not because they simply did not have the funds to reimburse the bank for the Tether deposits that it had made? Per their website (at the time of writing), only ‘institutional clients’ have the ability/right to purchase Tether. Despite the fact that the website stipulates that one must be a ‘verified customer’ of Tether in order to receive or redeem Tether tokens, there is no clear cut process on how one would become such a customer of Tether. There are also no verifiable accounts of any individual or entity receiving Tether for dollars in the last year or so and there are certainly no accounts of individuals redeeming Tether for dollars. We know that Tether, Bitfinex, and ‘Noble Bank’ are in bed together. This is undeniable at this point. We know that Tether is not receiving any U.S. dollars for the Tethers that they are issuing. Despite #1, #2, and #3 being true, Noble Bank is still having solvency issues and has allegedly sought additional deposits/funding from the company, Tether Limited, unsuccessfully. Given the above four facts, we must conclude that any and all money that has been deposited by Tether was probably a result of the funds garnered from Bitfinex operations (and perhaps other, under-the-table means). A) Insolvent themselves and simply cannot make any additional deposits with the bank. B) Tether is right in the crosshairs of federal law enforcement agencies and, as such, has removed its funding from any and all banks where it could be seized by federal authorities. Over the past day or so, many pundits in the cryptosphere that post frequently on Twitter (among other platforms) have noticed that the price of Bitcoin has been trading at a premium on several Tether-based exchanges, such as Kraken. At the time of writing, Bitcoin is trading for an approximate $40–50 premium on Bitfinex and other Tether-based exchanges (vs. Coinbase; a USD exchange). If you scroll through the thread, there are dozens upon dozens of individuals that have yet to receive their funding from Bitfinex and it appears that the list is growing on a daily basis. In fact, I have yet to independently verify that anyone has legitimately received a withdrawal from Bitfinex since the beginning of September. If there is any legitimate, verifiable evidence to the contrary, I would be more than happy to review. To say that Bitfinex is looking eerily Mt. Gox-esque in form would be an understatement. Ironically, the tweet by the Twitter user, Bitfinex’ed (cited above), shows that Brock Pierce attempted (unsuccessfully) to acquire Mt. Gox after its insolvency in 2014. Only time will tell how this situation is going to pan out — but it appears that Bitfinex and Tether are beginning to reach the end of their rope.